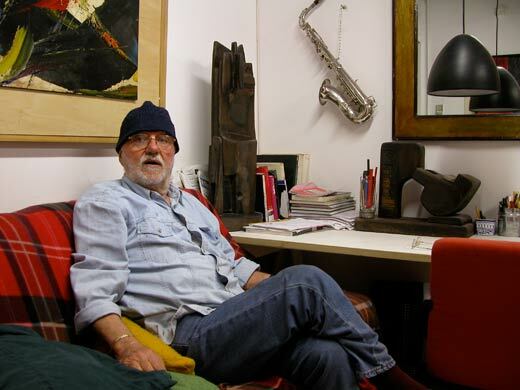 Danilo Picchiotti was born in 1933. His childhood and youth are characterised by the restless search of an artistic expression for his own sensibility and perception, as well as his very strong sense of existence. This would eventually lead him to join an art club known as “I Pennelacci” (the Paintbrushes) in his hometown in Rome at the early age of 18. He then starts devoting himself exclusively and passionately to reading and painting. He moves to Paris in 1952. In Paris he explores the stimulating and innovativeenvironmentsrepresented by the local versions of Surrealism of the period. From that moment onwards, he allows his own existence to be overwhelmed by his art until he becomes his art’s main subject, firmly convinced that self-consciousness and stylistic research are closely linked. This immense labour will find the truest expression of his artistic and existential sensibility in Surrealism. During the early 70s, the artistic environment in Rome and his successful participation to several collective art exhibitions, especially with the “Pennellacci” club, leads him to his public debut and paves the way to a very important and busy period. Later on, after enormous intellectual labour, he approaches the gestural informal painting, also known as “Action Painting”. This art movement was mostly developed in the United States, and is also called Abstract Expressionism. The most celebrated artist of this movement is Jackson Pollock. In 1986 Danilo Picchiotti holds a number of exhibitions of works that are strongly influenced by this art movement (action painting). In Europe, the French painter Jean Fautrier begins incorporating his paintings with plastic materials that burst out of the canvas, overcoming the boundary between two-dimensional images and plastic forms. This type of painting will be called “Matter Painting”; other painters will join this movement including Jean Dubuffet, Antoni Tápies and the Italian Alberto Burri. While some artists hide into the sign, others, including Picchiotti, emphasises the matter that identifies the work itself, by choosing any kind of material such as wood, fabric, glass, wall or even colour, which are arranged on the canvas, assuming their own physicality and are transformed, layer by layer, by using fire, water and other elements. Beginning from 2000, after several years of artistic inactivity due to health problems, Danilo Picchiotti, today more culturally open-minded than ever, returns to painting with determination, strength and energy giving birth to his new “GESTURAL MATTER” period.